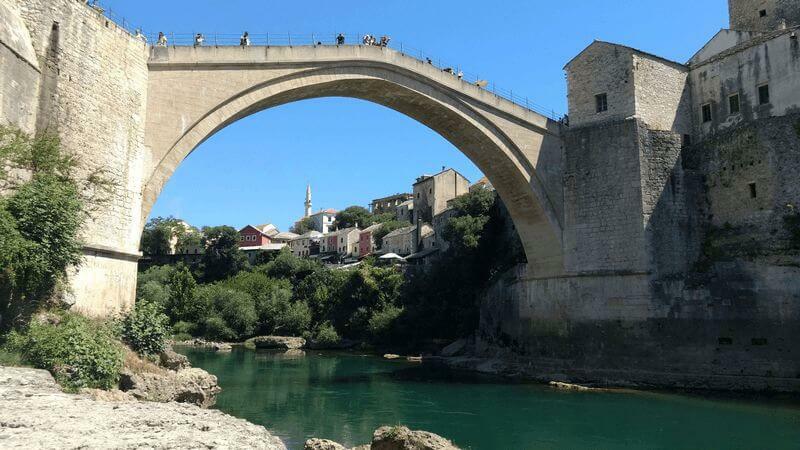 If you want to experience the region of South Dalmatia thoroughly, not wanting to do without Dubrovnik and its amazing city walls, this sail and cycle trip is an excellent choice. Accompanied by our charming motor yacht, we get to know this sparsely populated part of Croatia. Breathtaking scenic experiences and cultural highlights await you. 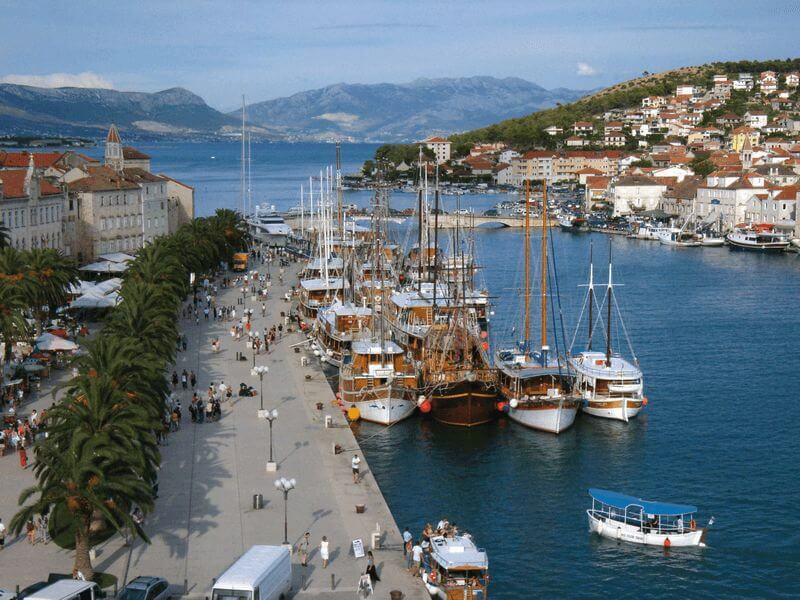 The highlights of the trip are the town centre of Split and Dubrovnik which are listed as UNESCO’s world heritage sites. We cycle the islands of Brač, Hvar, Korčula, Lastovo, Mljet and Šipan and experience the interaction of sea and land, culture and nature close up and personally. The direction of this tour alternates each week. This tour is part of our Plus-Program and matches activity with comfort. Our proud motor yacht Harmonia is your home for an amazing week. Welcoming roomy cabins with private bathrooms, a comfortable sundeck as well as a stylish salon await your visit. The tour details are barring changes, a.o. as a result of nautical, technical or meteorological reasons. We reserve the right to make changes to the planned itinerary due to changing wind and weather conditions as well as organizational requirements. Individual journey to Dubrovnik. Check-in on board starts between 2 and 2.30 pm at Gruž, the town port. At about 4:30 pm, a guided tour through Dubrovnik is offered, where you hear some interesting details of the town’s history and visit the most interesting sites. The boat will spend the night in Gruž offering the guests an opportunity to experience Dubrovnik’s nightlife. Our first crossing takes us to the island of Šipan, the largest of the Elaphiti Islands. 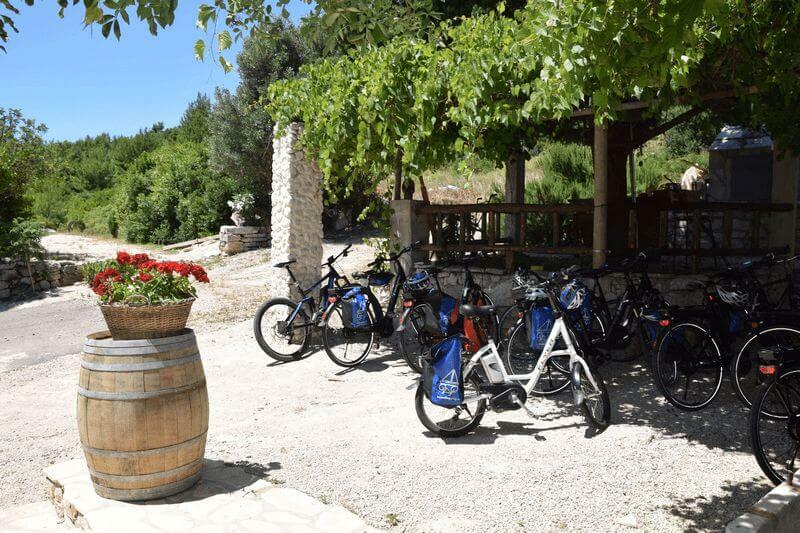 Accompanied by your tour guide a pleasant cycle trip takes us past villas with exotic gardens and through a fertile valley framed by a range of limestone hills. We pay the harbor town of Suđurađ a visit before returning back to the boat. 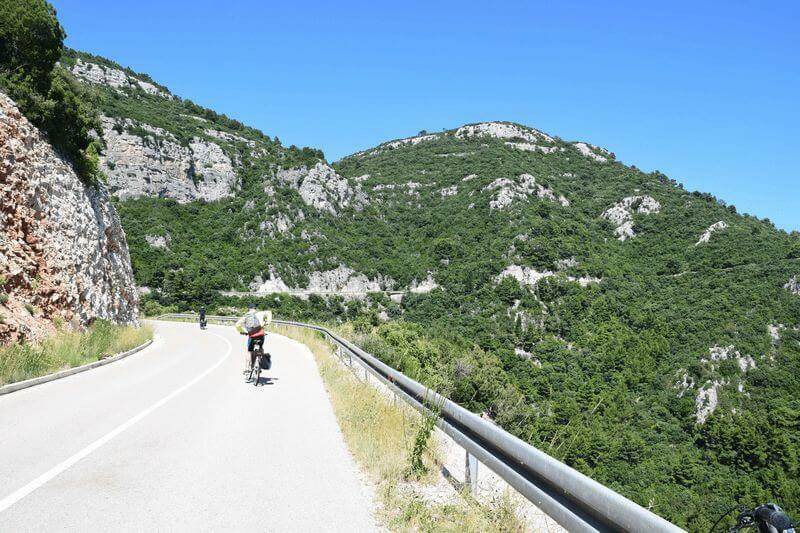 Today we cycle across to the green and forested island Mljet – known as the honey island. With 70 % of its landmass covered by woodland it is the most forested island in the Mediterranean region. Homer mentioned this lovely island in his epic poem “Odyssey”. He made it a home for the Nymph Calypso and the legendary Greek king Odysseus, who could not resist Calypso and stayed on Mljet for seven years. We cycle from Sobra to Pomena where we embark our ship and cross over to the Island of Lastovo. The island is one of the smaller inhabited islands in the Adriatic Sea. The Emperor Augustus appreciated the mild climate, and in Roman times it was even named “Augusta Insula” after him. The barely more than 1,000 inhabitants continue to live from fishing the extremely rich waters, agriculture and viticulture. Today’s cycle tour takes us in a large circle across the beautiful island of Lastovo. The gold-coloured white wine “Marastina”, known even beyond Croatia’s borders, is grown here. Back at the boat its time to cast off! A crossing takes us over to Korčula Island, regarded as one of the most beautiful islands in Dalmatia. The Picturesque town of Korčula competes with Venice for the honor of being the birthplace of the famous explorer Marco Polo. Use the evening to wander through the fishbone alleyways and soak up the vibes of this stylish town. A guided city tour will give you an overview of the city and its features. Today’s cycle tour leads us across the charming island of Korčula. A mild Mediterranean climate and a broad variety of different landscapes accompany us on the tour today. 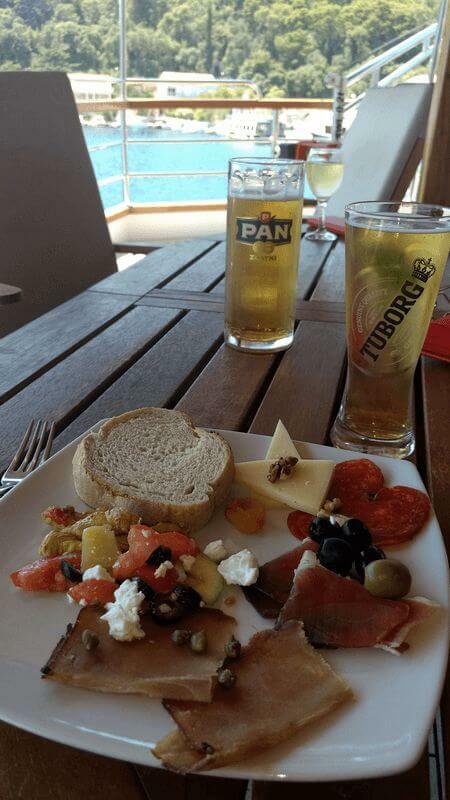 Take your time, and remember to take a break to enjoy the view over the deep blue sea and neighboring islands. Dinner is served on board to replenish our strength after an active day. Overnight stay in the sheltered by of Vela Luka. The day starts with a relaxing cruise to Hvar town on Hvar Island. Make use of the time before the cycle tour starts and go for a little stroll through the city. Standing on the magnificent Renaissance Square you can enjoy a view up to the Spanish fortress towering high above the city. Today’s bike tour takes us from the city of Hvar through small villages and lavender fields to Stari Grad on the opposite side of the island. The descent to Stari Grad offers breathtaking views. After a lunch break on board we continue to Jelsa. We cruise to the island of Brač, famous for its radiant marble that was, among others, used for the White House in Washington and in the construction of the German Reichstag building in Berlin. Today’s cycle tour leads us from Bol to the tranquil harbour of Milna. The boat awaits us here for a last crossing after an adventurous week. 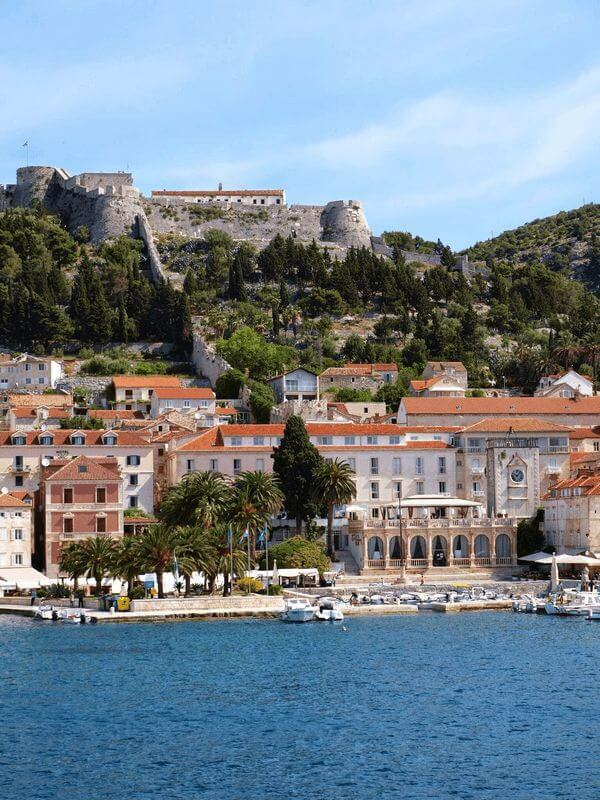 We board the boat and cruise to the UNESCO world heritage city of Split. A guided city tour offers us the chance to see inside the former Palace of Emperor Diocletian and to learn about its transformation into the city which it has become. A cheerful evening meal on board the boat gives you time to celebrate the success of the week with fellow travellers and tour guides. The cycle tours require an advanced level of fitness. The tours will take us up to a height of 200 – 500 m above sea-level. The day-tours up to 28 mi./45 km will take us through hilly and mountainous terrain and will be completed without any time-constraints. Participants will also need to master long and steep climbs. You are free to set aside a half or full day to swim or spend time on board the boat, instead of taking a planned cycle-tour. Helmet use is mandatory on all cycle tours. You are strongly encouraged to bring your own (well-fitted) helmet. Rental helmets are available in limited numbers (reservation requested). We believe that only children in a good physical condition and with a minimum age of 10 and previous bicycle tour experience are able to master the cycle tours on their own strength. Please note that the minimum height for a rental bike is 1.20 m (4 ft.) for hybrid bicycles and 1.50 m (4.5 ft.) for e-bikes. There is a helmet duty for all children up to age 16 in Croatia. The on-board chef is a member of the crew and prepares the breakfast and one or two warm meals a day. The catering consists of 4 x full board and 3 x half board. It starts with the dinner on the arrival day and ends with the breakfast on the departure day. Individual arrival in Split. Check-in on board starts between 2 and 2.30 pm at Split harbour. 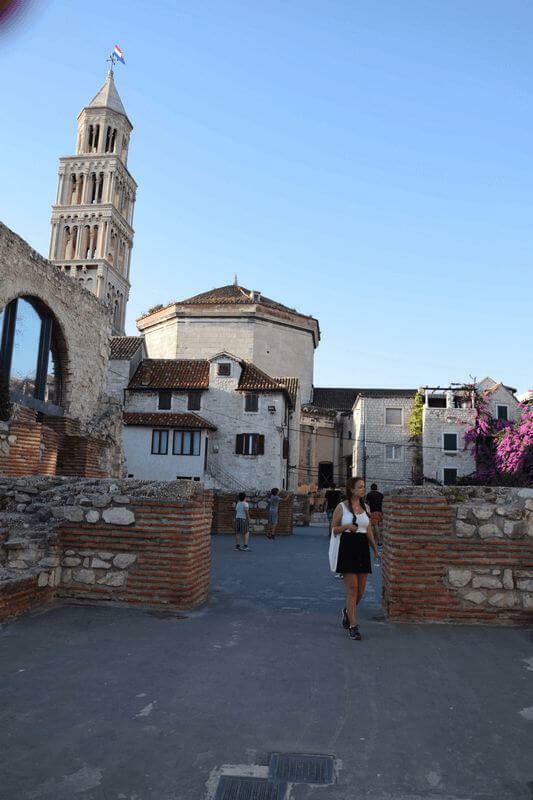 At about 4.30 pm, a guided city tour offers us the chance to see inside the former Palace of Emperor Diocletian and to learn about its transformation into the city which it has become. The boat will spend the night in Split offering you an opportunity to experience Split’s nightlife. We cruise to the island of Brač, famous for its radiant marble that was, among others, used for the White House in Washington and in the construction of the German Reichstag building in Berlin. Today’s cycle tour leads us from the tranquil harbour of Milna to Bol. The boat awaits us here for another crossing by boat to Jelsa on the Island of Hvar. Today’s cycling tour leads us to Stari Grad and later on to the opposite side of the Island of Hvar. After a short break our cycle tour leads us through lavender fields and small villages till we get to the islands capital. 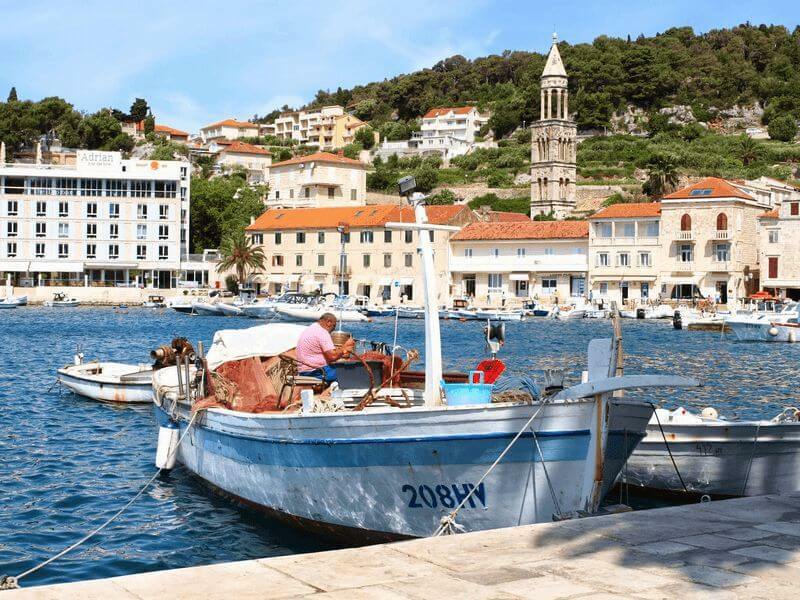 Make use of the time and go for a little stroll through the city of Hvar before boarding the boat. Standing on the magnificent Renaissance Square you can enjoy a view up to the Spanish fortress towering high above the city. Dinner on board and overnight stay in the sheltered bay of Vela Luka on the Island of Korčula, regarded as one of the most beautiful islands in Dalmatia. 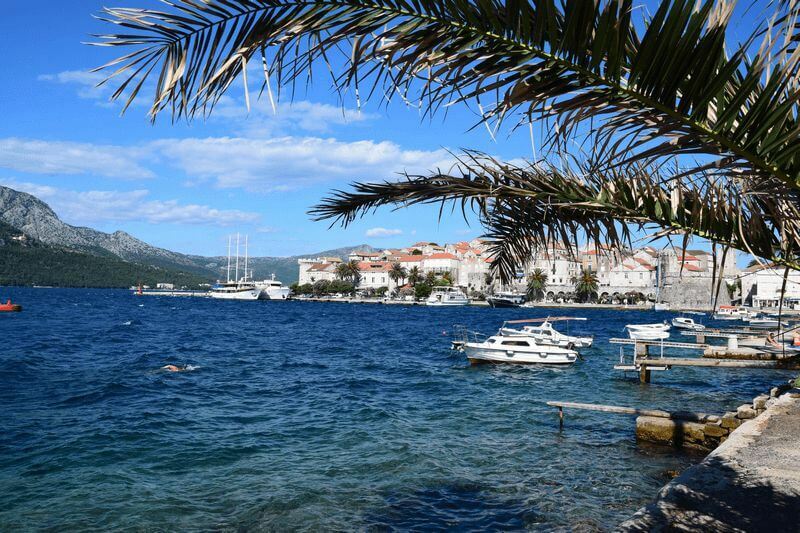 Today’s cycle tour leads us across the charming island of Korčula all the way to Korčula city. A mild Mediterranean climate and a broad variety of different landscapes await us here. Take your time, and remember to take a break to enjoy the view over the deep blue sea and neighboring islands. The Picturesque town of Korčula competes with Venice for the honor of being the birthplace of the famous explorer Marco Polo. Use the evening to wander through the fishbone alleyways and soak up the vibes of this stylish town. A guided city tour will give you an overview of the city and its features. And off we go! A morning crossing takes us to the beautiful Island of Lastovo. The island is one of the smaller inhabited islands in the Adriatic Sea. The Emperor Augustus appreciated the mild climate, and in Roman times it was even named “Augusta Insula” after him. The barely more than 1,000 inhabitants continue to live from fishing the extremely rich waters, agriculture and viticulture. Today’s cycle tour takes us in a large circle around the beautiful island. The gold-coloured white wine “Marastina”, known even beyond Croatia’s borders, is grown here. Dinner is served on board as the sun sets. We start with a short crossing to the next island: Mljet. 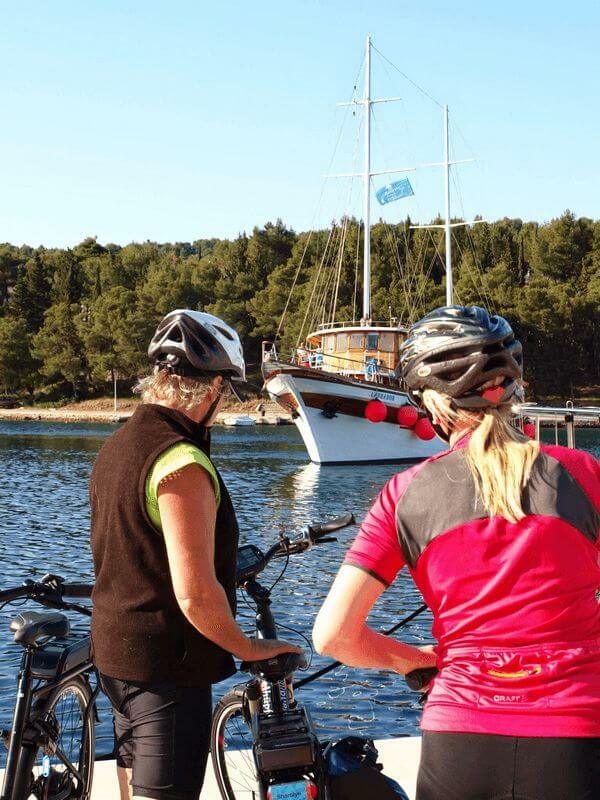 Ashore at Pomena on Mljet we cycle across the green and forested island – known as the honey island. With 70 % of its landmass covered by woodland it is the most forested island in the Mediterranean region. Homer mentioned this lovely island in his epic poem “Odyssey”. He made it a home for the Nymph Calypso and the legendary Greek king Odysseus, who could not resist Calypso and stayed on Mljet for seven years. A short crossing in the morning takes us to the island of Šipan, the largest of the Elaphiti Islands. Accompanied by your tour guide a pleasant cycle trip takes us past villas with exotic gardens and through a fertile valley framed by a range of limestone hills. Returning to the boat we enjoy our last crossing after an adventurous week. After arrival in Dubrovnik there is plenty of time to explore the UNESCO world Heritage city and to take part on a guided city tour. A cheerful evening meal on board the boat gives you time to celebrate the success of the week with fellow travelers and tour guides. After breakfast disembarkation in Dubrovnik until 9 am and individual trip home or extended stay in Croatia. Split – Dubrovnik on: April 21; May 5 and 19; June 2, 16 and 30; July 14 and 28; August 11 and 25; Sept. 8 and 22; Oct. 6 and 20. Dubrovnik – Split on: April 28; May 12 and 26; June 9 and 23; July 7 and 21; August 4 and 18; Sept. 1, 15 and 29; Oct. 13 and 27. With three or four people sharing a cabin, we allow a 50 % discount on the basic tour price for the third and fourth person, regardless of age. Children up to age 16 receive a discount of 25 % on the basic tour price (not combinable with the 50 % discount); Surcharge for single cabin use will be added. Overview-maps for the daily tours on board. Please click on the ship to see a description of the bicycles. Helmet use is mandatory on all cycle tours. You are strongly encouraged to bring your own (well-fitted) helmet. Rental helmets are available in limited numbers (reservation requested). Relaxing trip own wonderful boat. Not for serious bikers. Limited distance and ride time. City tours at stops were very helpful. Great guides. Fish meals on boat were great. Drinks were a bit expensive. Great and knowledgeable tour guides. Our family with kids 11 & 14 immensely enjoyed the bike rides through spectacular scenery. E-bikes were ideal. The New Star boat was top notch. Highly recommend this trip! The elegant, pearly-white motor yacht, Harmonia meets the highest expectations when traveling along the Dalmatian coast. This two masted beauty has room enough for 16 luxurious cabins and a commodious salon. This is where you will enjoy first a good nights’ rest before you savor a biker’s breakfast. 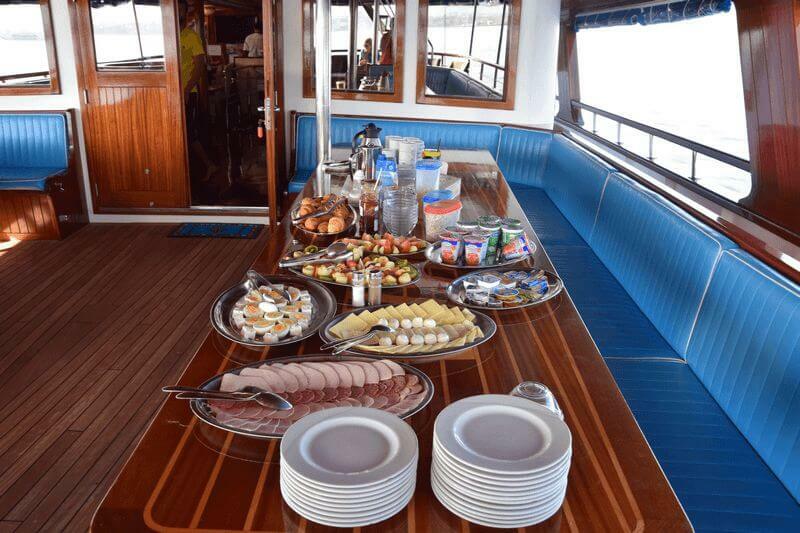 And during the evenings the hospitable crew will serve you a well prepared dinner. Sunbathers will like the mattresses and deck chairs on the sun deck. Thanks to the platform at the stern, it’s easy and fun to take a dip in the sea. The FLEXeBIKE by Tempora stands for innovation; a high end e-bike which can be transformed into a standard hybrid bike by removing only the battery. At aprx. 19 kg the bike is amongst the lightest touring e-bikes on the market, available in frame sizes: 46 cm – easy entry, 52 cm – trapez, and 58 cm – diamond. be achieved. Shimano V-brakes insure that the bike comes to a safe stop. The CST anti-puncture tires provide a carefree riding experience and great grip. FLEXeBIKE – Panasonic rear wheel hub The supporting electric motor is a high performance Panasonic rear wheel hub motor which runs on a 800 Wh rechargeable battery. The rechargeable battery can support riders using the highest level of support for up to 80 km.